The most basic HTML page content comprises text and images. To add text, just type (or copy and paste) text into an open Dreamweaver document just as you would in a standard word processor. You can do this either in Split view or Design view. If you’re working in Split view (with code on one side, and Design view on the other), be sure to paste text into the Design view side of the Document window. Otherwise, if you paste text into Code view (or the Code side of Split view) Dreamweaver will think you’re copying HTML code, which you’re not. Normal editing techniques like Find and Replace (found on the Edit menu) or spell checking (buried unintuitively at File→Check Page→Spelling submenu) are at the ready. If you have major document editing to do, edit text in a word processor. Dreamweaver’s editing tools are okay, but just okay. If you’ve come to rely on those squiggly red underline markings that show you spelled a word wrong, you won’t find that feature in Dreamweaver’s document window. If you create or edit text in a word processing document, you can easily copy it into the Dreamweaver Document window. Click in Design view (remember: not Code view, or you’ll paste your copied text as HTML code, which it’s not). 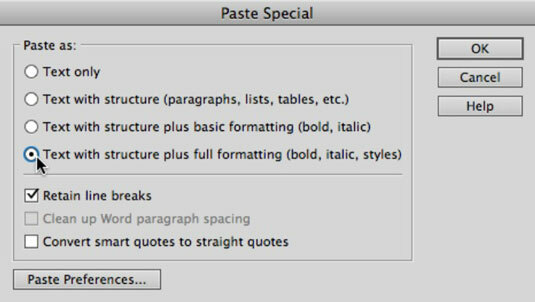 Choose Edit→Paste Special to see what options Dreamweaver offers for preserving formatting from your word processor. There are four options, ranging from Text Only (which strips all formatting) to Text with structure plus full formatting (bold, italic, and styles). The results you get from different paste special options vary rather widely depending on the source of the text. So, instead start with the forth option, the one that preserves the most formatting. If it doesn’t work well (like if it pastes in text with too much formatting or features that weren’t really part of the original formatting), try different options. Avail yourself of the Dreamweaver Document menu’s Edit→Undo feature if the paste results don’t do a good job of preserving your formatting.